Buying a Home: Do You Have a C.L.U.E.? You have just found your dream home, and being a smart homebuyer, you want to make sure there are no costly repairs or problems before you buy. The most common method of finding issues with a home is the home inspection. What you may not know, are home inspectors are limited to a specific scope of work and liability since they are not required to be general contractors or tradespeople. If an inspector misses a problem with your home, in many states, they are only liable up to the cost of the inspection. In addition, inspectors can not tell you the history of a house, nor can they give you an overview of what may have been repaired or altered behind the walls. These details are only available if you have a C.L.U.E. report! C.L.U.E stands for (Comprehensive Loss Underwriting Exchange) and it provides; the reason an insurance claim was paid, dates of claims, whether the loss was related to a named catastrophe (hurricane, etc. ), location of the loss, and the amount paid and cause of the loss. In short, a C.L.U.E report tells you about insurance claims against the home for the last 5-7 years. This is important, since sellers often do not accurately disclose Mold, fire, water, and electrical damage. Using the C.L.U.E report, in conjunction with your home inspection report will provide a more accurate profile of the home you are buying. If you have never heard of a CLUE report, you are not alone. A survey commissioned by insuranceQuotes.com, found that 82 percent of Americans have never heard of the report which includes Real Estate agents and Realtors. Where can I get a C.L.U.E. report? 1) A free C.L.U.E report can be obtained once a year from LexisNexis. Requests can be made online or by calling (866) 312-8076. LexisNexis requires the CURRENT homeowner request the C.L.U.E report. 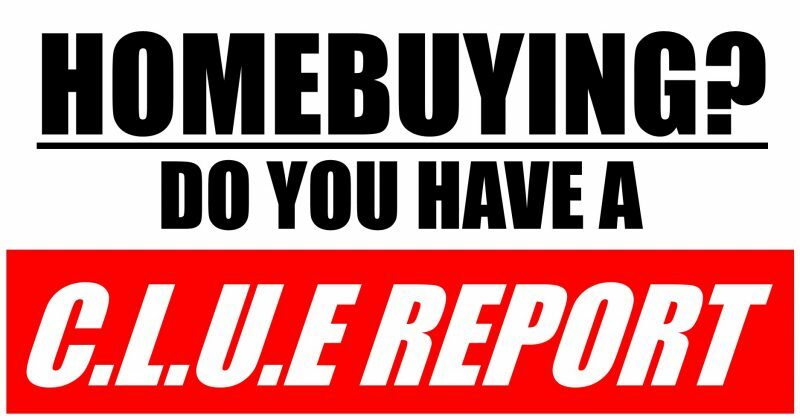 If you are buying a home, I would suggest you require the current owner obtain a C.L.U.E report as part of your agreement to purchase the home. 2) If you are obtaining homeowners insurance for the house, ask your insurance agent to give you a summary of the CLUE report. Most insurance agents will provide the report for no charge if you are insuring the house through them. When buying a home, always obtain as much information as possible on the house you have selected. A few minutes of planning and discernment, could save you $1000s of dollars in the long run. Happy House Hunting, you now have a C.L.U.E.! !